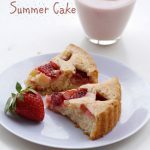 Eggless Strawberry Summer Cake Recipe with step by step photos – I made this eggless strawberry cake almost a year back and finally posting now. I have more than 50 recipes in my drafts and I will be posting all those recipes back to back. So keep watching this space. 🙂 .. 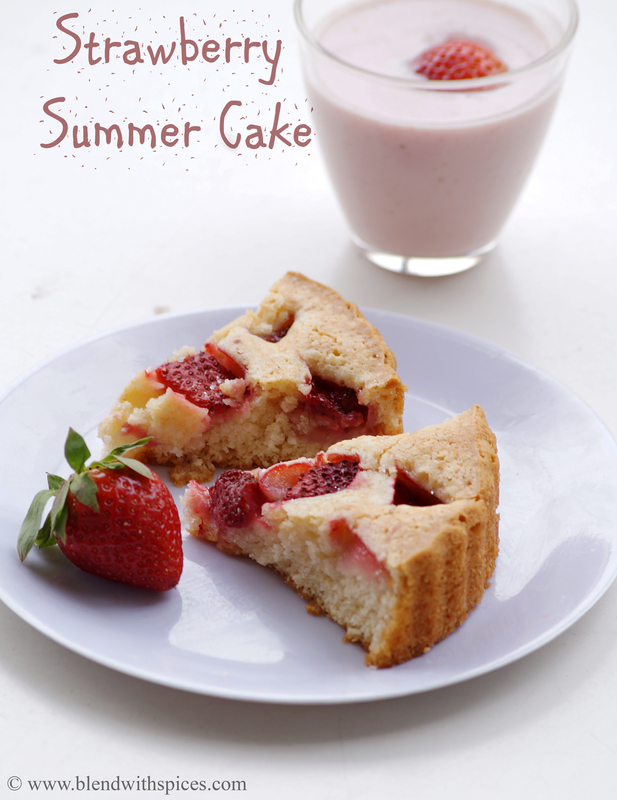 This eggless summer strawberry cake is a super simple cake recipe with very few ingredients. It can be served as a dessert or tea time snack. If you want to bake this strawberry cake on stove top, refer my Eggless Chocolate Cake Recipe to know how to bake a cake without oven. If you are looking fore more Eggless Cake Recipes then do check Eggless Strawberry Lamingtons (with video), Eggless Mango Tutti Frutti Cake, Eggless Custard Cake, Eggless Dates Cake and Eggless Vanilla Sponge Cake. 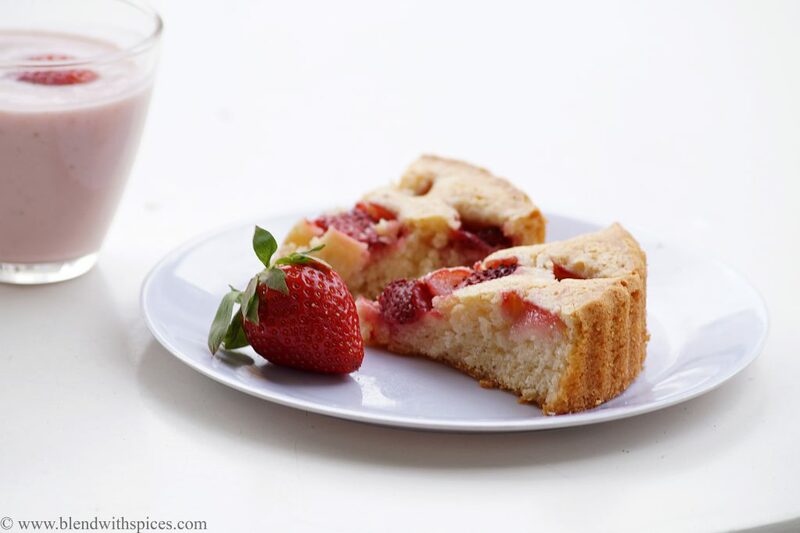 Eggless Strawberry Summer Cake Recipe with Step by Step Photos. 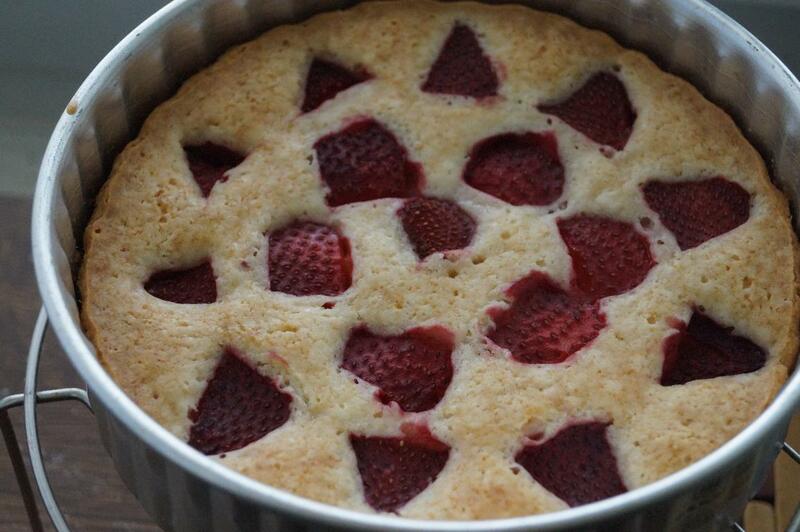 An easy eggless cake with strawberries. 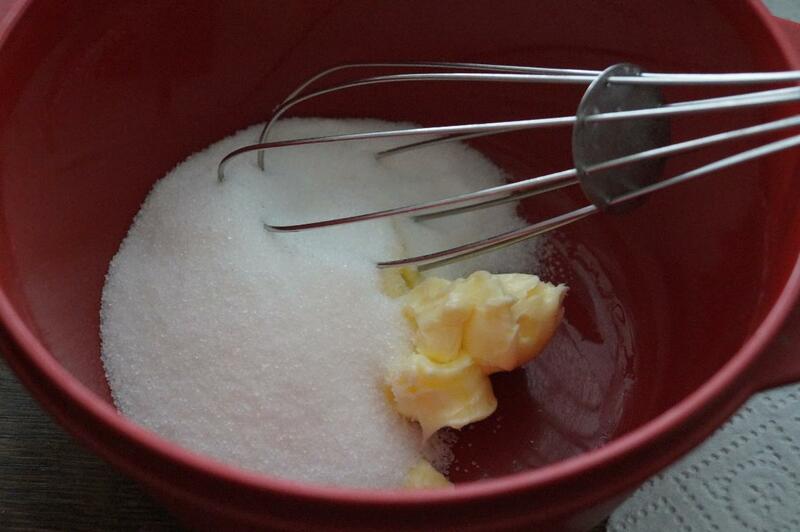 Whisk the flour, baking powder and salt together in a bowl. Keep it aside. 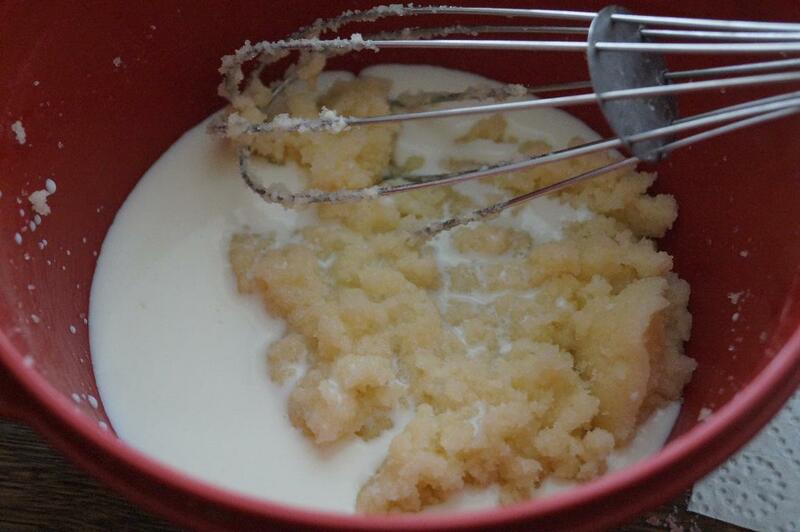 Combine the butter and 1/2 cup of sugar in a mixing bowl until well combined. Add milk and vanilla essence and mix until just combined. 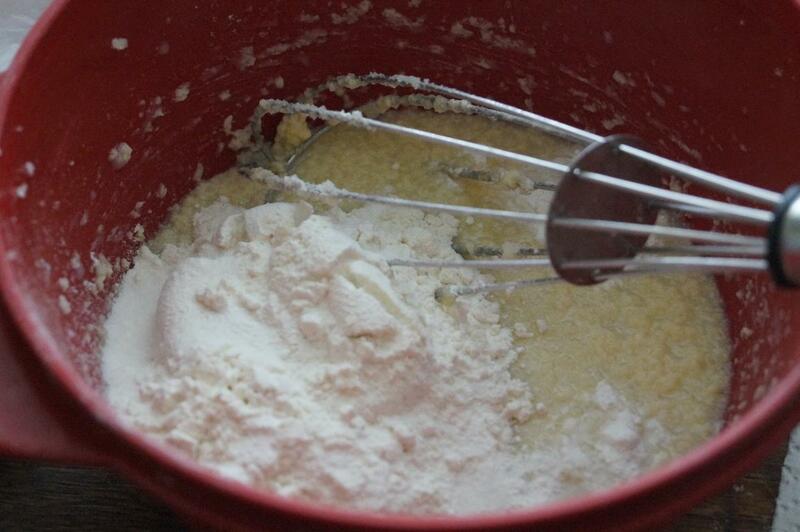 Now add the flour mixture and gently mix until the batter shows no trace of flour. 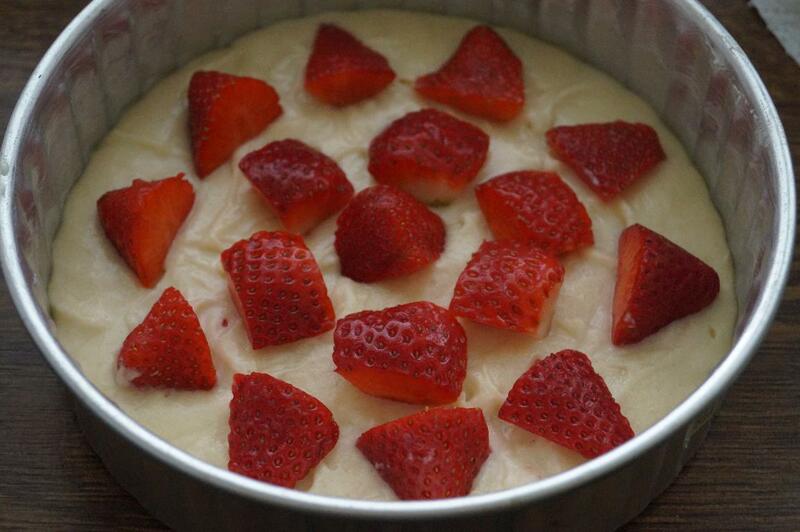 Quickly pour the batter into a greased cake tin and arrange the halved strawberries on top of the batter. Sprinkle the remaining sugar over the strawberries and bake in the preheated oven. Bake at 180 degree C for about 30 - 35 minutes or till a toothpick inserted into the middle of the cake comes out clean. Serve as a dessert or tea time snack. Bake at 180 degree C for about 30 – 35 minutes or till a toothpick inserted into the middle of the cake comes out clean. Too yummy and superb clicks…. Hi ,cake looks great. Would like to try it out. Can you please lmk the size of the cake pan? Depends on each households taste.